Oh, one thing I have to warn you about visiting this place is the queue. If you’re visiting in the summer and don’t really fancy the idea of being stuck in a slow-moving line for an hour or two then buy your tickets in advance. You can do it online (www.louvre.fr) or you can even use the general Paris Museum Pass. (www.museums-of-paris.com/museum-pass.htm). Either way, you’re safe. And if you’re extra kiasu, you can even enter for free on the first Sunday of every month month, and on July 14 (Bastille Day); provided you don’t mind squeezing with 24,000 other kiasu people (visitor numbers go up by about 60% on free-entry days). If you’re heading to the Louvre for the first time, the next important thing you should do prior to your visit, is plan your route. Unless you want to wander aimlessly across 652,300 square feet of artefacts and art that may not entirely make sense to you, chart your visit very carefully. Decide what you want to see first. If you have no clue as to which masterpieces are more important to you than the others, the official Louvre website has visitor trail suggestions which you could potentially help (http://www.louvre.fr/en/parcours). Despite this being my second visit, I still find myself in awe of everything, including the ceilings. You can laugh all you want, but I am seriously intrigued with the details that go into making the Louvre, the spectacular work of art that it is, on its own. I mean, you can take away the contents of the museum and the Louvre will still be as interesting to explore, because of its architecture. What do you think? She is now the second most famous work of art in the world, behind the Mona Lisa. Question is – is she Aphrodite, Venus, Artemis or Diana; and how exactly was she holding her (now missing) arms? Ok, back to the story. At the time when the Greek peasant found Venus de Milo (1820), the Turks were in charge of Greece, so they obviously managed to just take the statue from the peasant without any resistance. Poor fella. Anyway, Venus de Milo was later sold to the French for 1,000 francs, roughly the cost of a sizable herd of goats. Not much huh, considering how priceless she is today. The statue was presented to King Louis XVIII (who by the way, was so fat that he had to be moved around in a wheelchair) and the French sculptors tried to provide arms for the statue, depicting her holding all kinds of things, from apples to lamps, and pointing in various directions. H.W. Janson (Russian-American scholar of art history) described it as "the greatest masterpiece of Hellenistic sculpture". If you’re somewhat lost at this point, the Hellenistic period dates from the death of Alexander the Great in 323 BC to the emergence of ancient Rome. At this time, Greek cultural influence and power was at its peak in Europe and Asia. Hellenistic art/sculpture is basically the art/sculpture of that particular period of time. While you’re thinking shoes and Michael Jordan; Nike, in reference to the “Winged Victory", is said to be a Greek goddess who personifies strength, speed, and victory. She is seen with wings in most statues and paintings as with this particular one. Although it is incomplete (they are still yet to locate/unearth her head and hands), this statue of Nike it is considered as one of the greatest surviving masterpieces of its times. Okay, here’s the thing. I’ve always wanted to visit Egypt. The rich cultural legacy of ancient Egypt has always intrigued me, but that’s another story. I look forward to visiting one of the oldest civilizations on earth some day, but in preparation for my future trip to Egypt (thank you God in advance! *grin*), this little excursion around the Louvre has definitely given me a taste of what to expect. As you can see, a single day in this massive fortress of treasures isn’t enough; and if you’re planning to visit, don’t forget to bring some water, snacks or whatever it is that keeps you going. *wink* Till tomorrow's video! Mwah! So, is this a macaron or a macaroon? 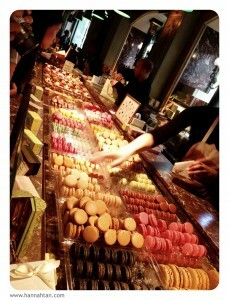 And this, is a macaron (thanks to the rest of you who got it right ;-)), which is what I wanted to talk about. Next question – where does the macaron originate from – France, Switzerland or Italy? Aha! While most (including Moi) would say France, the macaron actually originated from Italy, although it was later made popular by the French. I suppose it is safe to say that the French owe their iconic association with this sweet treat to the great Catherine de' Medici; who was arguably, the most powerful woman in sixteenth-century Europe. Apparently, Catherine (who was Italian by the way) brought her Italian pastry chefs from Italy to France in 1533 when she migrated to marry Henry II of France at the age of 14. Actually, both Catherine and Henry II were 14 at that time. Naughty Henry II ended up cheating on Catherine the year after they got married, with a 35-year old cougar, but that’s another story. So back to the macaron. According to Wiki, the name is derived from the Italian word macarone, maccarone or maccherone; basically, the Italian meringue. Apparently, the original version of the macaron were two shells (imagine two slices of plain bread) served with jams, liqueurs and spices; until a French boy came up with the idea of sandwiching the two shells together with a granache (filling made from chocolate and cream) center. 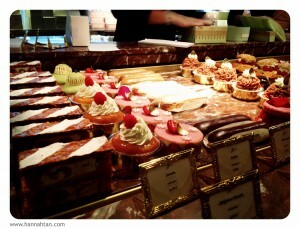 His grandfather, Louis-Ernest Ladurée, thought it was a brilliant idea and decided to incorporate it into his pastry shop – Ladurée – which later become synonymous with macarons. Today, 151 years after the original pastry shop was founded, Ladurée remains as one of the best known makers of macarons in the world; selling approximately 15,000 each day. 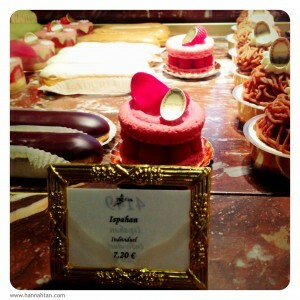 During my last trip to Paris, I wanted to see for myself, what the fuss about this famous sweet biscuit was all about. You see, at the flagship outlet in Paris, people actually line up for up to an hour just to buy these little things. Can you believe it?! This is supposed to be Ladurée's the signature macaron. I bought one! :-D €7.20 per piece! But to be fair, it's double the size of the normal macaron and it's got some raspberries in it (with a rose petal on top of the whole thing)... [trying to comfort myself]. I must say, the overall dining experience was quite pleasant. I took a video of the food tasting so that you can have an idea of what the general French cuisine is like. Since this post is starting to get a tad too lengthy, I'll share the video with you next week ok? *smile* Till then, here's a big panda hug for a fantabulous day ahead! Mwah!!!! Spending some time in Paris made me realize how such a skill is so vital for people who want to drive within the city, which probably explains why most people say that Parisians (and to some extent New Yorkers too) are world champions at the art of creative parking. Truly amused, I managed to sneak some photos to illustrate the fascinating discovery. If you're up for a few creative parking tips, try searching the web for "Parallel parking in Paris", and you'll find some rather entertaining videos to illustrate just that. Hehe. I can’t help but feel so fortunate knowing that we as drivers don’t have to subject ourselves to such torment back home in Malaysia. 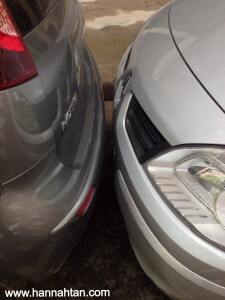 For one, we have significantly more space within our “legal” slash dedicated parking slots; and for the other, it is not a norm for drivers to go around bumping into one another’s cars, and getting away with it so easily. Sure, parking assist technologies like cameras and sensor systems can be quite reassuring, yet for the parking-impaired, nothing beats self-park cars (hint to the husbands). Soon, with autonomous vehicles, we wouldn’t even need a driving licence, but until then, when it comes to parallel parking, I’d say, practise makes perfect.